Anchorman: The broadcast continues with the program “Theme”, I'm Alexey Kuleshov. Hello! And on the eve of the City Day, the guest of our studio today is Ilsur Metshin, the Mayor of Kazan. Good evening, Mr. Metshin! A.K. : Mr. Metshin will answer your questions, which you sent before the live broadcast. You can ask questions right now as well by the number 554-22-22. Meanwhile, we begin. Mr. Metshin, we will celebrate the Day of the City and the Republic on Wednesday. Our capital will be 1012 years old. How will we meet the holiday, in what mood? I.M. : I'm sure, in a good, festive one. There is everything for this. Kazan citizens have worked very well this year. Much has been done, you can see it in figures, and I hope the residents have already felt it themselves. This year the amount of work done on the roads is unprecedented, more than 6 billion rubles were allocated for this. And it is a serious figure. Even in past years, when we did a lot, especially compared to other big cities. Citizens, too, have the opportunity to visit neighboring regions and compare. Therefore, 6 billion is an unprecedented figure even against the previous years, when we have worked with 3-3.5 billion. A.K. : So there was the doubled amount of money allocated for roads this year? I.M. : Yes, doubled. We managed to fix roads that we didn’t do for a long time. Not just central ones but also those roads, on which only pit fixing was done for years: streets Botanicheskaya, Kirpichnikova, Pionerskaya. It's such a nice long list. This is the first thing that I would like to note from what was done to the Day of the City and the Republic this year. A large amount of work is done in the yards. We started with one figure. It was planned to make 180 yards but we repaired 340 ones. I.M. : That’s right. Even I tell you about the figures what was done on the main roads, in gardeners' partnerships, how many yards have been repaired. But I understand that anyone can ask the question “when our yard will be fixed?” Always the volume of what wasn’t done is more. But I am sure that we will come to every yard with such support from the President and the Government. This time is not far off. We have been systematically solving these issues for almost eight years now. There is something to report. And it is very important to raise the level for each Day of the City, to set ourselves the task and improve the city. We must reach the goal that we set ourselves: to become the most comfortable city. These are the results we have for the Day of the City but the year is not over yet. We will have time to work, with God’s help. A.K. : Mr. Metshin, you said at the city pedagogical council that you are ready to launch a competition for the best environmental education program for schoolchildren. Is it really necessary? I.M. : It's absolutely necessary. This is our tomorrow. Otherwise, we will stay in asphalt and piles of garbage. I hear different comment on this, “why a separate collection of garbage, we’re not Germany!”. We are better than Germany! I believe in our population, in children, in the fact that we can conduct a dialogue with them. They can be accustomed to this, and parents, grandparents through them as well. It's normal practice. I learn from my children, too. We must and want to live in a clean, well-organized city. Therefore, we must introduce separate garbage collection and other environmental training programs. That way we will live in a clean, well-maintained, well-groomed city. It cannot be beaten by the number of janitors, the desire of the Mayor or the amount of money. Everyone should participate in this, stop throwing trash on the streets. I remember well how many people did that, threw bottles from the window of cars in the summer in the early 2000s. You driving, and a candy wrapper flies to your windshield. Now it happens rarely. I want to thank the residents, the drivers, who do not litter on streets and in yards. Our city is becoming purer and more comfortable thanks to your love and respect for the city and for yourself. Every year it can be felt more and more. A.K. : August 30 is the Day of the City and the Republic. We'll start celebrating from the very morning. Just a few words for the holiday. I.M. : <...> I want to thank the residents for their joint work. We worked together. Those numbers, half of which I could not cite in this short time, is the result of a joint effort, for which I thank you. On the eve of the Day of Knowledge, I want to wish everyone well and healthy children, pleasing their parents. And the next year to be successful in everything. I wish our city prosperity. We must set new goals, reach new tasks: to live in the most comfortable, beautiful city. I want to congratulate everyone on the eve of Kurban Bayram as well. Thank you all very much. A.K. : Thank you very much. 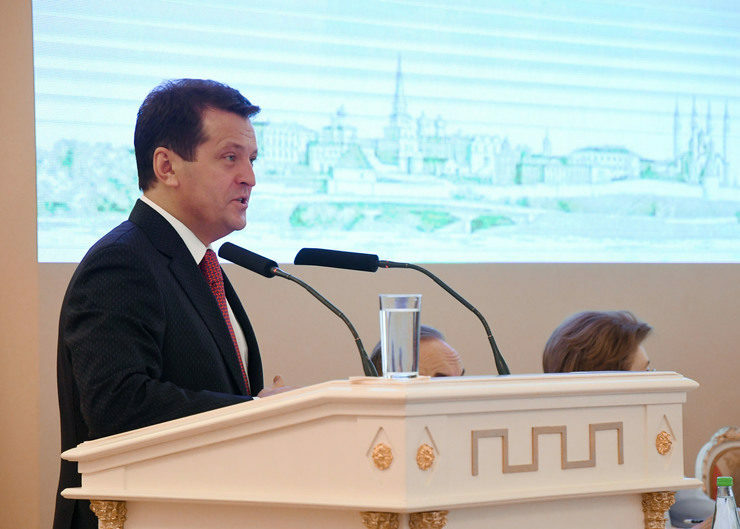 Ilsur Metshin, the Mayor of Kazan. Thank you for your attention. Goodbye!